Maine Coast Sea Vegetables baker Kara Ibarguen sorts through kelp flakes before using them in energy bars. The company sells certified organic seaweed and seaweed products such as organic energy bars. 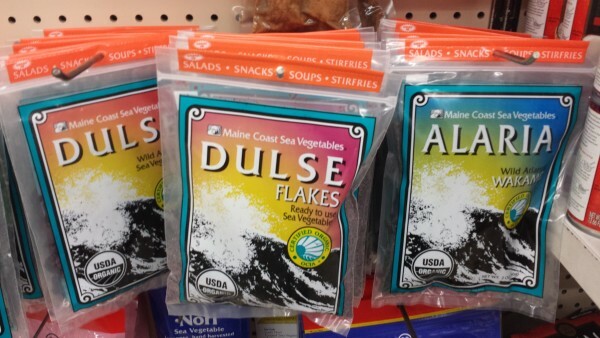 Seaweed products made by Maine Coast Sea Vegetables in Franklin are displayed at an Ellsworth health food market. BOOTHBAY, Maine — The Gulf of Maine and its extensive coastline have long attracted fishermen and entrepreneurs looking to harvest everything from periwinkles to whales. As technology and resource abundance have changed, the targeted species and the marine products made from them have as well. Whaling is now banned but, as lobster landings in the gulf have soared over the past 25 years, researchers have been looking to develop products such as golf balls and dog biscuits made from discarded lobster parts. And now, marine researchers in Maine are setting their sights on something that, though much smaller, is on track for having a much more widespread impact on the consumer goods market. Maine Technology Institute, a state-funded nonprofit that supports technological ventures, announced last month that it is contributing $50,000 to help develop the state’s algae industry. This includes seaweed companies, which have harvested macroalgae species such as kelp, rockweed, dulse and Irish moss in Maine for decades. But it also includes microalgae firms which, like their many of the “macro” counterparts, are having a growing impact on the pharmaceutical, dietary supplement, food product and biofuels industries. Bigelow Laboratory for Ocean Sciences, headquartered in the village of East Boothbay, will be the lead agency in organizing an industry advisory group in Maine to identify what some of the challenges are and what might be done to address them. The $50,000 MTI grant is expected to produce a strategic plan for the industry within the next six months. Bigelow Lab is a logical entity to lead the effort because it stores and maintains 3,000 strains of microalgae in its National Center for Marine Algae and Microbiota. Michael Lomas, a senior research scientist at Bigelow Lab and director of NCMA, said Friday that the center sells samples from its repository but also offers its scientific services to entities that are trying to develop specific algal compounds for possible commercial applications. Lomas said the lab’s center has several clients that are in advanced research stages for developing viable products from algae. Lomas said the lab has nondisclosure agreements with its clients, so he cannot publicly identify them, but he said some are on a scientific par with larger, publicly traded companies such as San Francisco-based Solazyme in terms of the commercial applications they are pursuing. “Algae are a great source of omega-3 fatty acids,” Lomas said, and produce carrageenan, which are used in food and personal care products. According to WebMD, omega-3 fatty acids “deliver some big health benefits” when included as a regular part of a person’s diet. 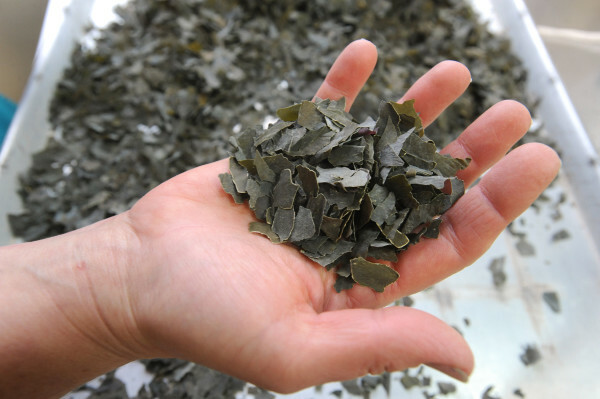 Lomas said that Maine’s seaweed industry generates $40 million to $50 million in revenue each year, which he characterized as “non-trivial amounts of dollars.” Maine’s capacity for wild seaweed harvests is not expected to increase much more due to practical and regulatory limitations, he added, but the industry does have potential to grow by developing new products and by expanding into aquaculture operations. Shep Erhart, president and founder of Franklin-based seaweed firm Maine Coast Sea Vegetables and a member of the new advisory group, said investment in the industry will help his 44-year old business, which is in the process of moving to a larger facility in Hancock. Lomas said the U.S. is behind the rest of the world when it comes to scientific algal research, and that Maine is in the “middle of the road” in the field compared with other states. But he said Maine does have a distinct edge when it comes to its amount of shore frontage. Maine has a lot more space than other states for marine products companies to set up shop, at an affordable price, within reach of the ocean water they need for their operations, he said. Maine also gets more sunlight than other Northeast states, which helps with algae growth, he added. “The coastline gives us a huge advantage,” Lomas said. The Bigelow Lab scientist said that, if the strategic planning phase goes well, the industry group likely would apply for a subsequent $500,000 grant from MTI to help implement some of the ideas it comes up with. “That’s a totally separate application process,” he said.